Happy NEW MOON in Capricorn January 1st 2014 (SuperMoon)! We start of the New Year with a New Moon in Capricorn! A SuperMoon with some strong aspects at play calling us to activate and unearth that which has been lying dormant within. “The earth element is strongly featured for the first New Moon of the New Year. The New Moon is in Capricorn at 11 degrees which suggests having a fresh fertile soil within the subconscious so the new ‘symbolic seeds’ are planted for the year ahead. “The Capricorn New Moon on January 1 is a SuperMoon. This means it is extra potent. The New Moon is closest to the earth and in direct alignment with the Sun and the Earth. “New Moons are new beginnings. You have a new start in Capricorn. The structures of your life are to be examined and changed as needed….The Capricorn New Moon message is time to upgrade and improve your life. 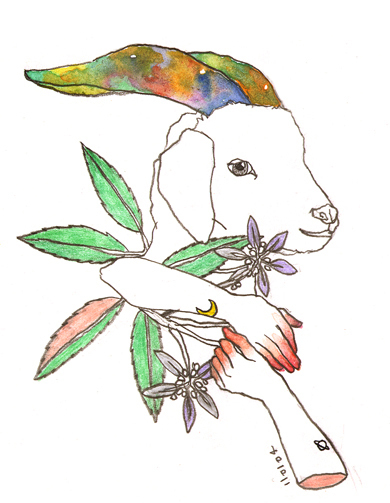 “Capricorn is the goat climbing to the mountain top…You are to climb higher and merge with your God Consciousness. Pulling your Higher Consciousness into your choices will empower you to live an authentic life. You will live from love not fear. You are a great spiritual being. You are having a human experience. You are a powerful creator. What do you want to create in the New Year? “The Sun and Moon are coupled with Pluto and Mercury. Pluto is considered the most powerful planet in astrology. He is not a maybe planet. ‘Change or I will change you’ says, Pluto. “There are two roads to take with Pluto. One is divine will. The other is ego will. Pluto, used to serve your highest good, is the wisest path to take. Pluto will empower your soul and help you make healthy choices. “The cosmic message for the Capricorn New Moon is live from your authentic power. Be who you truly are. Be open to change. Upgrade your life where needed. “The ego resists change. This is the ego’s way of distracting you from getting on with the business of living. What is not built on truth is collapsing. Being powerless because you see someone, others, or society having power over you. This is illusion! The ego is playing a game of denial. “Be honest with yourself. Have you ignored the warnings and now conditions have worsened? You are a powerful creator. You can use your power to improve your life. Have better relationships. Work with passion and feel good. Remember that, you have an important role to play or you wouldn’t be alive. You matter. You count. There is no one who can replace you. You are a valuable treasure. “The Capricorn New Moon (Jan. 1, 3:14 a.m. PST) catalyzes a grand cross between Mars in Libra, Jupiter in Cancer, Uranus in Aries and Pluto in Capricorn. “The planets involved represent strong yang forces, intensified by their presence in action-oriented cardinal signs. Do-or-die Pluto conjuncts the Sun, Moon and Mercury and exactly squares headstrong Mars. This forceful call for evolutionary change can prompt a fresh start, but it can also trigger antagonism and impatience if we’re not careful to channel it wisely. “Because this powerful energy colors the entire year ahead, we can expect 2014 to be a magnificent, make-it-or-break-it year. “The good news is, if you’re inclined to cut ties with the past, launch new projects or begin running marathons, this alignment will give you the push you need. The bad news is, if you persist in clinging to old patterns or being less than your authentic self, you’re apt to suffer. “Complicating the planetary picture, Venus is currently retrograde in Capricorn (Dec. 21 – Jan. 31). Pleasure-loving Venus can feel weighed down in that serious earth sign, but she’s also able to devise effective plans for change, and cement healthy habits in existing relationships (not a great time to start new ones, though). “Don’t rely overmuch on others’ financial or emotional support during this retrograde, as it’s meant to guide you into your own depths to reclaim your talents, power and self-esteem (although it is a good time to recoup losses or receive money owed to you). “According to the Austrian philosopher-clairvoyant Rudolf Steiner, balance is the psycho-physical sense we must develop in Capricorn. When we steady ourselves, we steady the world. If we slip and free fall, the world goes spinning. “The alliance you forge with Capricorn now can strengthen your footing for the entire year. Capricorn is a climber, inspired by high goals. But nothing is gained without first achieving balance on the terrain immediately beneath your feet. “Be willing to move into pioneering new directions with sensitivity and a sense of caution. A lot that is set into motion by this New Moon will be much clearer by late February and March, and the growth promised during January will help us deal with the hodgepodge traffic jams in the collective consciousness. HAPPY NEW MOON & NEW YEAR! Thank you…always thankful for your light! Thank you…xxxxxx looking forward to my new life in 2014. This resonates with me more than anything I have ever read. I am currently seeking changes in all aspects of my life! I am a capricorn and I get all of what has been written. So thankful for this Super moon which I intend to use to make great steps in my spiritual journey. Many hugs! This really resonates with me too…and it’s also really empowering. Thank you! My 30th birthday is on the 1st of January and this has helped clarify things happening now and prepares me to focus on the right path in 2014. Thank you! Your January 1st Birthday gives you the King of Spades in The Cards of Destiny! You have the most powerful card in the deck! Your Planetary ruler crd is the the “Five of Clubs” known as The Quest For Truth”. You may like to look into the cards! And Thank You MM for this truly Grand Compilation! This resonates with me more than anything ever in my life.i have been blessed with learning that I will be a father for the first time my girlfriend is three to four months pregnate.and we’ve known about our baby for almost three weeks now. In fortunately she left me on the 25 th broke up with me on the 26 th refussed to see me on my bday (27th) and I’ve she’s having second thoughts about having our child. This has been the most difficult time in my life ever but I have been directed toward love and understanding on why all this is happening right now and these articles on the website have helped me emensley to figure out why everything is happening and puts everything in perspective so that I may grasp everything and make wise conscious choices.i am working very hard on many different levels to use all these energies and experiences to my benefit so I may grown as a person and spirit and am looking forward to enjoying the fruits of may labor so I may become the kind intelligent loving father I’ve always wanted to be.thatnk you for your help I feel blessed after readings everything on this page. Your girlfriend cannot terminate a pregnancy and end you relatioship while venus is retrograde she will live to regret it big time!!!!! The challenge now is to stay on the path with integrity, not the “short cut”. Thank you from the top too the bottom of my heart. 2013 was one of the worse years of my life, however, I learned so much from it. I am powerful. I am confident. I will be patient and watch for signs and prosper. My birthday is January 19, on the cusp and I am more on the Capricorn side however, I have a lot of Aquarius characteristics. I am creative. These articles appear as if they were written only for me, they speak to me and I am going to be phenomenal in 2014. I knew before reading that I need to clean my mind of negativity and the people that produce it. I will not play their game any longer. Thank you again, you have no idea how much this has reinforced what I have been thinking and feeling. Many blessings to all of you and to the new year. As always.. magnificently resonant. Thank you for sharing. Many blessings to you! Lovely insights and helpful during this time of big change and energy. Happy New Moon and New Year! Shared fully with heart. Abundant NYE to you. Thank you. Bless you all for your words of wisdom and insight. Truly grateful for sharing the new SuperMoon updates. Forward to all the wonderful happenings in 2014. Thank you, blessings and well wishes upon you for a wonderful New Year! Gemini _ thank you for your words of wisdom and insight. Many blessing to you. Thanks for the updates… Pretty sure it will helps me a lot. Love lots to mystic mama. thank you! i always love these. happy happy New Year! Amazing information and I send you a big hug for sharing. So interesting that I am relocating on January 4th to a more northern state. I have lived in FL for the past two years. I am following my intuition. The house is up for sale:) My golden retriever and I will be heading out! She is an Aries and I am a Cancer. She sends a tail wag. I have come to love the divine wisdom, that is spoken on this site. Thank you so very much, rebirthing is very powerful for us all and this information is just what I needed to hear to help me face myself and plant new seeds, of empowerment, trust and faith in my self and the divine light. may the divine source continue to bless us all. Thank You for your many posts in one place. I have a 11′ Capricorn ASC, and this last year has been a significant time of deep inner turmoil and personal change. I am seeing the light at the end of the tunnel. This powerful conjunction and new moon on my Ascendant is helping to fuel the fire for transformation and letting go. What a way to start the new year. After reading this I now understand where my drive for being sucessful is coming from. My fiancé dumped me on my birthday (29 December) and kicked me out of her house telling me that I need to be more independent and be able to stand on my own to feet there after I findout news that my best friend and my fiancé hooked up together in a matter of days after she left me. I didn’t understand all my emotions and trust me there is a lot but after reading this I feel that my positive attitude towards letting go and getting over them means so much of sense I’m concerntrating on me myself and I. And hope perhaps 1 day I will find my right woman. Something inside me changed on the 31st of December. I was at the bank at suddenly felt my personal energy change in a way that I can only describe as an inner polar shift. I suddenly felt calm, optimistic, thankful and dare I say, happy. I was gifted with many things that night. An evening with family that included a day early “just us” surprise birthday party (my birthday being January 1st) with balloons and small tokens of love and appreciation. My birthday was spent at home – still just immediate family and it was quiet and peaceful – a rare thing as someone always needs something from one of us (a place to vent, to ask for help with their own issues is a daily occurrence). Maybe this year I will learn to how to block other peoples – I don’t know what it is. Energy? Emotion? It’s draining. :) On the 1st , my body has decided now is the time to begin to “change” LOL … but I feel in control and … again, calm. Now I know why. Thank you for posting this. I read this and it opened a new assured phase in my life. After all I actually feel I needed to read this as I now am sure that the path i am taking does align with your theories and suggestion to almost 100%if I may say . I appreciate it when someone like you share his knowledge and pass it on for others to see,use and learn from ,that in itself is a real contribution to the big world . I was born on the cusp of Capricorn and Aquarius. I’ve felt conflicted for the longest time. I have big plans for 2014 at work and my relationship. (Back with the man I was with for 18 yrs) We’re both spiritual and loving. Accepting our mutual regrowth. We have both been sick for the last couple of weeks. I hope that it is our bodies detoxing the negativity. Thank you for all of this information. I always stay positive and look for my spiritual guidance. My girlfriend ended our 7 years of relationship on 2014 new years day for no apparent reasons her reasons were so she can pursue her career abroad. I was so hurt and still going through a shock a rough patch and keep wondering as to why this has happened. I mean did she meet anyone? Is it really her career progression? All sorts of questions comes to my head but nothing makes sense. We had a good healthy relationship with few arguments here and there but never ever thought we would get here. Oh yeah I forgot to mention she was a Capricorn, im a Scorpio. Did the venus in capricorn had any influence on her decisions? Is it something she will regret later? Any advice would be much appreciated. Paul, I am a Capricorn and over and over I keep leaving a Scorpio man who has brought more destruction and pain than love into my life for the past few months. He refuses to let me go, but every time I take him back he hurts me more. I know he isn’t right for me and I really need to stop being distracted by him every time I try to find a new job and become a better mother. His negative and controlling influence is stressing me so much! I’m not saying your Capricorn girlfriend left you for the same reason. But maybe there’s something that has been pushing her to find out what she needs to do to pursue what feels right for her and her life right now. Perhaps she doesn’t feel like she can devote as much of herself to a relationship right now. Capricorns in general are very focused on their work and responsibilities. I don’t think she met someone new. I think the reason she stated for leaving is the truth. I am sorry your relationship has ended after so many years. I think there are good things ahead for you, but not if you hold on to her. Annabelle thank you so much for sharing your views I appreciate that. What you have said may possibly be true as she was always career orientated and only I would know because I was there throughout her academic years until she found her first proffesional job. What really hurt me the most was the way she broke up with me on a NEW YEARS DAY from abroad as she was away for christmas holiday,over the phone. I mean I gave her 7 years of my life and she ends me over the phone? I deserved better than than. That was one of the worst way to break up with someone you were intimate with for 7 years. We were just fine before she left on her holiday when I mean fine I mean fine. I am still baffled as to why while she was there came to this decision, what triggered her decision and actions. It took her 7 years and on a new years day of 2014 to realise that she was not happy in the relationship and wanted to be single as that would make her happy (according to what she said) I guess I’ll never know. I keep asking myself the same question over and over again – who was she? I feel like i never knew her as well as I thought I did. people like her makes me wonder is there such thing as love in this world. I always had trust issues since my early 20s because of another experience in my early life, she was aware of that. When I met her I started to confide and trust again even love once again. She has shattered that all over again. And this time im really knocked out. Its been almost 2 months i have not spoken to her and im still struggling to find closure. Annabelle I just wanted to know if you are still with your scorpio man? If you dont mind me asking how does he hurt you? if you could elaborate on that, I can perhaps give my views as to why he probably does all those things to hurt you. I’m hoping that by now something has happened, or you’ve heard something from your ex to get the closure you need. After seven years, you are at least owed that. At the time that I was writing my first response to you, I was in so much turmoil from my relationship with the Scorpio man that I overlooked that aspect of your ex-girlfriend’s departure. How sudden and impersonal! I’m seeing it now. I don’t know enough about your seven year relationship with her, aside from it being mainly healthy and peaceful as you have mentioned above. I have to say though, a typical Capricorn finds it very difficult to present themselves in a way that does not reflect their true feelings and intentions. For me personally, if forced into anything I’m not happy about, everyone around me will see my frown, no matter how hard I try to just do what I need to do. So I feel that she was indeed the person you came to know. During your early years together, her years of studying, working, etc. If she did not genuinely love you and want to be with you during that time you would have known it. Especially since Scorpios can easily see past any front or deception. Most likely, she went through an inner change so drastic and so chaotic that she may or may not have even been aware of what was happening to her. For me personally, there was no way I could have predicted the changes in me that have turned my life upside down this past year. I even SHOCKED MYSELF! Once the transformation began, I felt as though I was outside of myself, watching ME act out of character but there was nothing I could do to stop or resist it. It was unavoidable. The changes in my life included leaving a long-held job, a sudden divorce and change of residence. As frightened as I was by these ‘unexplainable’ events, something deep down felt right about them. I was forced out of a comfortable but stifling job, marriage and home. Terrifying! Difference is – I have not cut my ex-husband out of my life. We remain friends and I plan to still be a helper and support to him no matter what. Married or not married, we are family now because we have a daughter together. But back to your ex – I feel she ended things so suddenly, impersonally and in a manner so out of character, even knowing about your trust issues because she felt it was the right thing, no matter how difficult it was, to end things quickly and without dragging it out to make you suffer more. I’m not saying it’s right, just that it was probably her logic. I can’t say for sure that she has NOT met someone new, but my overall feeling is that she is pushing herself harder than ever on her current goal – her career. Thanks MAMA… This is phenomenal as if written for me. I have been going through immense tension and problems since last Three years of marriage but didn’t have courage to take any major step. Your update has given me confidence and courage to take decision. Loads of love to you and blessings. Thanks thank you so much.. Thank you so much mama for this update. I am married since 3 years and my husband is also Capricorn born on same day as me 11 Jan and we posses same date of birth. I am struggling in married life since day 1 of our marriage. He is very ssarcastic and demanding. We don’t have good communication rather I would say we don’t communicate at all. There was a time initially that my marriage was about to break ie (divorce state ). But I had conceived that time and I wanted to have child, I was believing that everything will be after child comes in our life. But after that also we used to fight and till date we fight, even on small things our thoughts does not match. I cry so much everytime cursing my destiny that why I did this marriage and spoiled my life and child’s too. But when I think of my son I cannot take decision of Breaking this marriage. But my heart says today also that m not happy in marriage. I am tired of his sarcastic nature and cannot sustain anymore. Sometimes I feel to run away with my child. It’s not the thing that I can’t take care of my child. I am earning. I am a software engineer and a SAP CRM consultant and earn good money that I can take care of one family. But when I think of my son I don’t dare to take decision. Please suggest me something. I am really worried. Need your help.